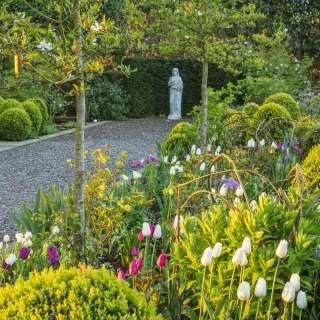 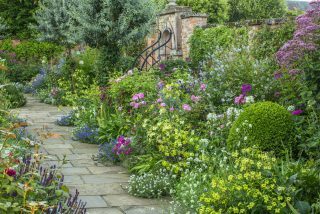 On two sides, the deep borders of this garden are split by a wide flagstone path, which broadens out even further into a spacious terrace before the south elevation of the house. 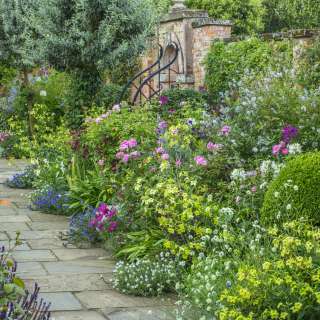 High old brick walls back the borders to the south and west. 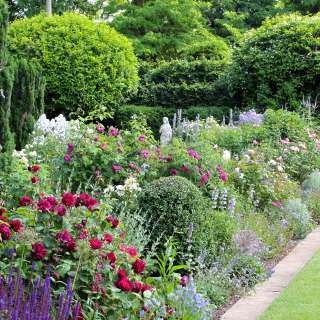 The three borders and the terrace surround a formal lawn. 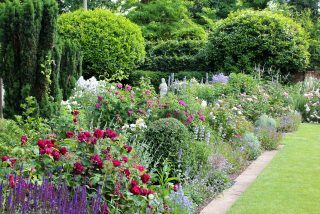 Centred at the end furthest from the house and covered in climbing roses and clematis, stands a wrought iron garden arch with a bench and a fountain of white sandstone. 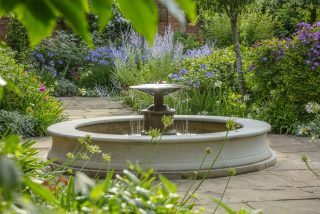 From the bronze centrepiece, a translucent veil of water falls gently into the pool. 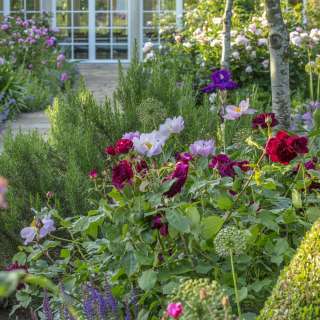 The planting is sumptuous, its mounds spilling onto the paving. 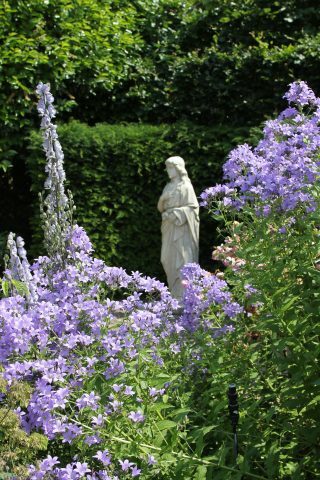 Here, as elsewhere in the gardens, the contrast of informal softness and stark geometry creates theatrical drama. 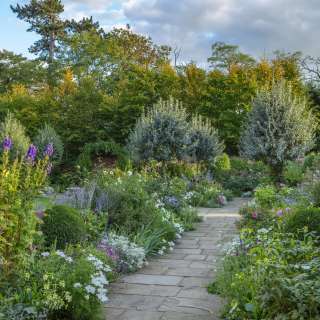 The colour palette of the planting is impressionist in a display that lasts from late April well into the autumn. 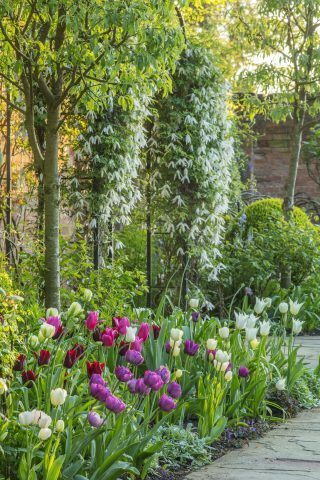 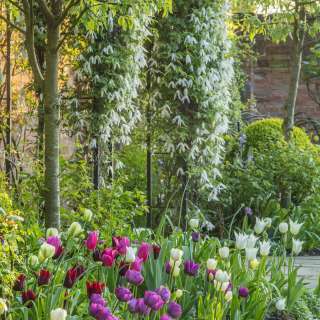 Two and a half thousand tulips in seventeen varieties along with the blossoms of snow white magnolias and a majestic listed white horse chestnut mark the beginning of the flowering season, accompanied by an array of clematis tumbling from walls and arbours. 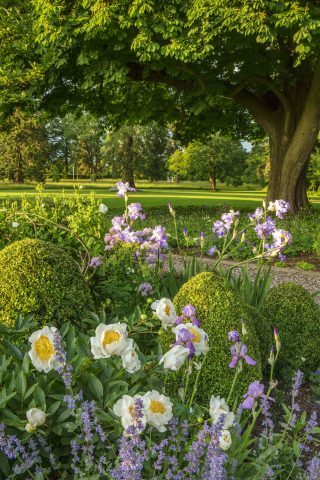 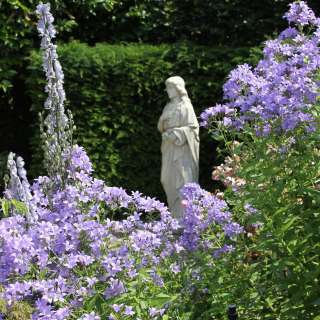 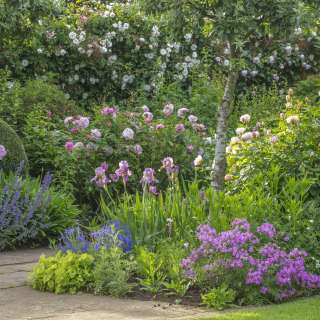 These are followed in succession by alliums, peonies, Iris germanica in shades from silvery white to purple black as well as salvias, and the mounds of veronicas, nepetas and Phlox carolina. 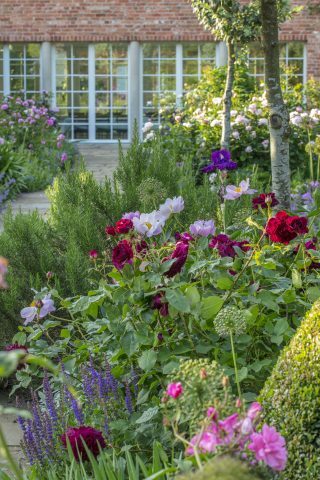 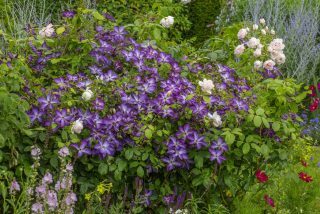 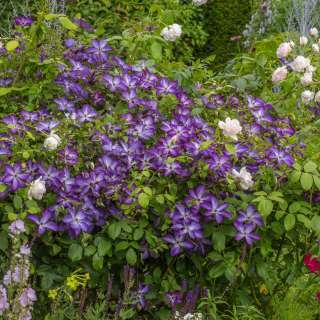 In early summer, combinations of almost seventy rose and clematis varieties take centre stage; each pair artfully pruned and trained to create the notion of weightless mingling. 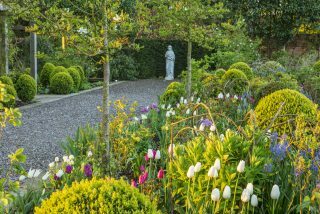 Dreaming spires of aconites, veronicastrums and campanulas add drama to the scene. 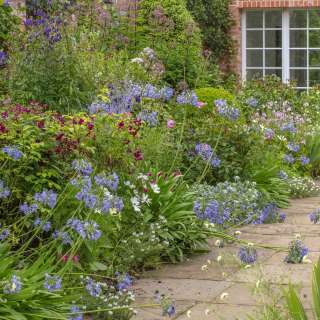 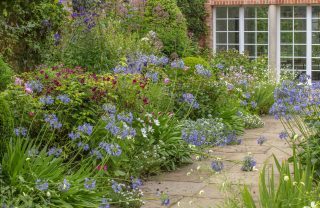 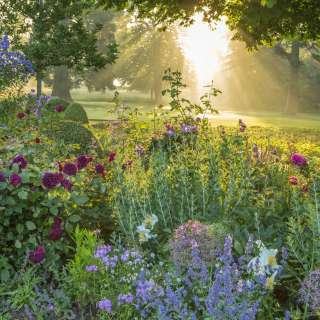 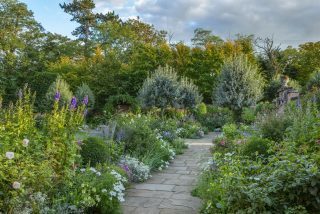 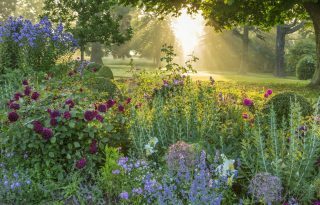 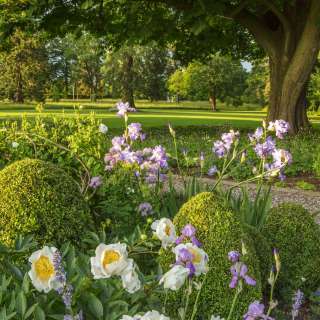 The spring tulips are replaced by a host of summer annuals including cosmos, echiums, zinnias, nicotianas and cleomes which carry the display through to the autumn, mingling with penstemons, perovskias and blue and white agapanthus. 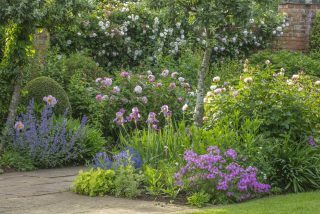 In late summer and early autumn, eupatoriums, echinaceas, asters, Phlox paniculata and Japanese anemones have their moment.